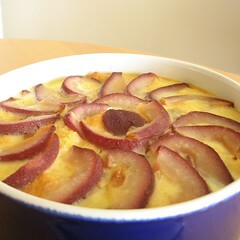 Vanilla Bread Pudding with Spiced Poached Pears - Do You Know The Muffin Man? Notes: The pudding recipe is from Caprial's Desserts and includes 4 cups of half-and-half and a lot of eggs: 5 whole ones plus 6 yolks! I used the idea given in the Apple variation and poached some Forelle pears in a spiced red wine syrup from Schneider's book. Her recipe for the poaching liquid includes black peppercorns, coriander seeds, cardamom pods, star anise and bay leaf. It took a long time to set: about an hour and a half. A little too sweet as I used pandoro again and forgot to reduce the sugar. The pears were not as tender as I would have liked but the pudding got many compliments from my tasters.